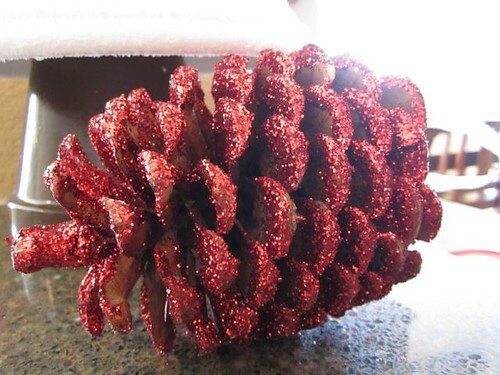 I had this wonderful awful idea to add glitter to a few pinecones. 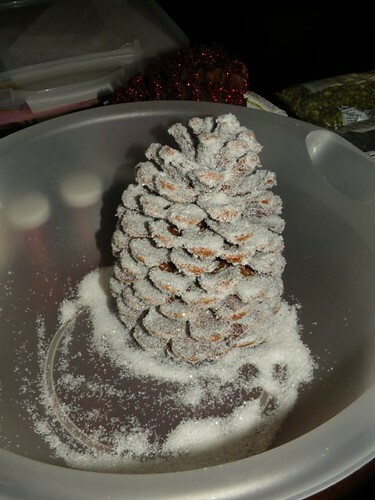 As you can plainly see, I made a white glitter pinecone. But I also made a red one! 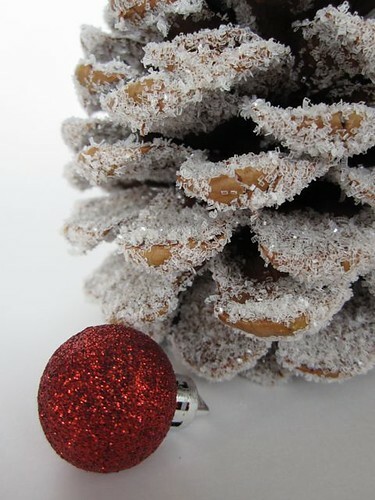 Yup, I made a total of two glitter pinecones. After that I gave up because they were a PAIN in the you-know-what if you know what I mean. 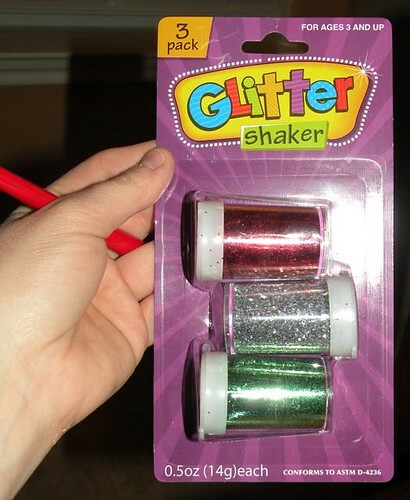 I bought this 3-pack of glitter from Dollar Tree. 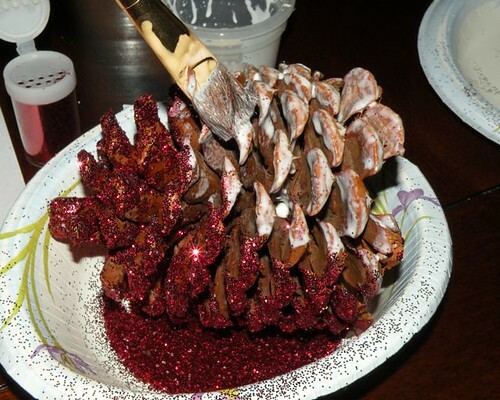 And I thought, “What better way to use this glitter than to decorate pinecones!” And so the plan was hatched. But let me forewarn you, my tutorial is extremely inefficient and if I were reading how to do this, I’d laugh at myself. AKA, don’t copy me, copy HER. 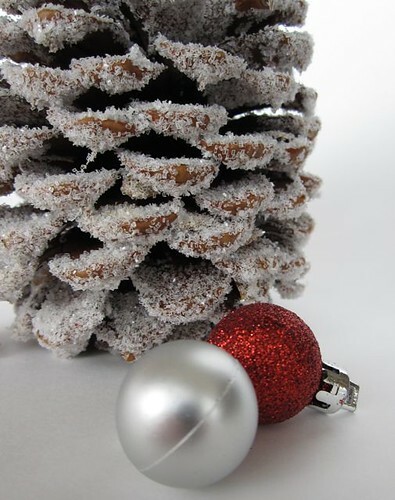 Kelli at Random Thoughts of a Supermom has an excellent tutorial on how to add glitter to pinecones. Seriously. When I read this tutorial I had a total Homer “Doh!” moment. She’s a genious. I’m, well… obviously not. 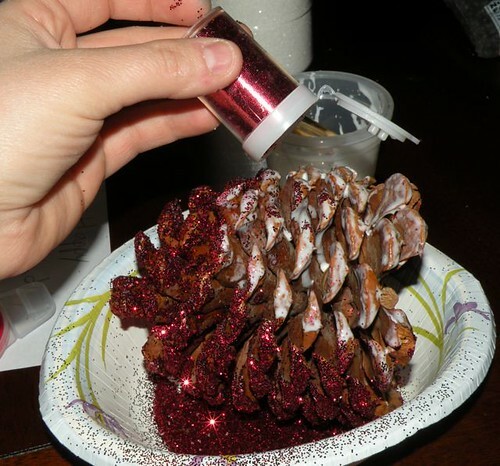 So anyway, here’s the way I added glitter to my pinecones…. (you’ve been warned to not copy my tutorial). In the end though, it looks pretty darn cute if you ask me sitting up on it’s throne. I went to my stash and found a candle stand and spray painted it heirloom white. Then I added the pinecone and a beady pick. 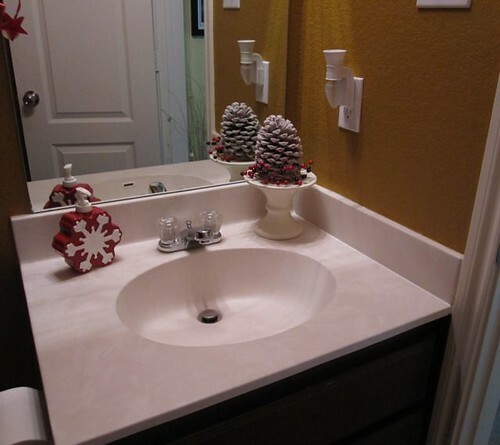 And then I plopped it down in our yet-to-be-painted-or-decorated guest bathroom. Aaaaaaaaaaaaaaand I love it. I don’t love that it took me a ridiculously long time to paint and glitter the pinecone when I could have added spray adhesive and shake-and-baked it in a paper bag. It’s fun to pretend you’re a photog when all you have is a mini fit-in-your-pocket Cannon point-and-shoot (PowerShot SD940 IS from Costco to be exact in case you want to go buy one for yourself). I just used the flower setting (close-up setting), natural light in front of a window on a table, and a white posterboard. And on a completely irrelevant side-note, isn’t this soap pump just the cutest thing you’ve ever seen? So, in closing, what is the point of this post? A) Glitter pinecones are ah-dorable. B) Random Thoughts of a Supermom has a great tutorial. 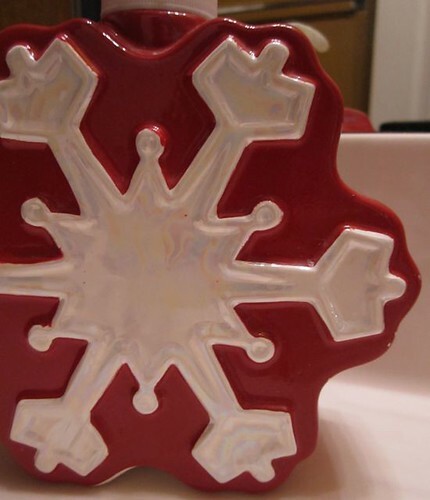 C) the snowflake soap pumps from Target are cute. Can I just say……………..super Mum or not, I LOVE your blog!! I read your blog on a regular basis – and I enjoy a lot. 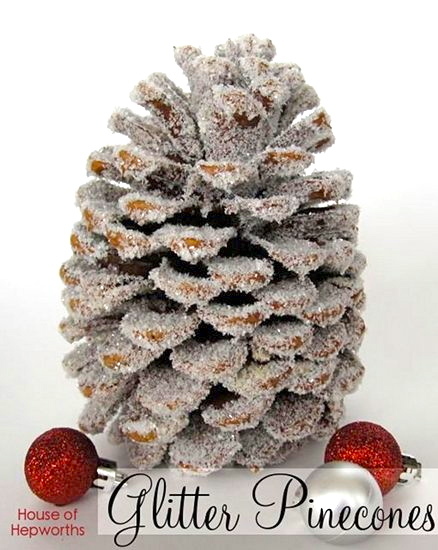 I am in love with your glittered pinecones…. so pretty! Another HOH project to put on my to-do list! Thanks so much for the shoutout! 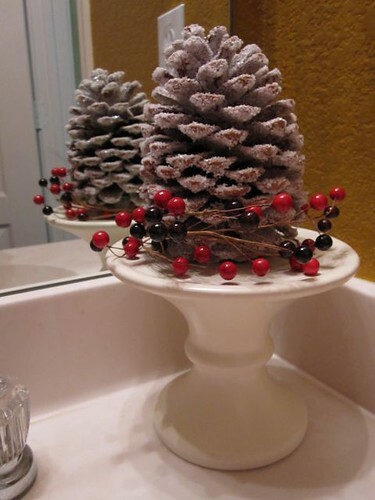 With three boys in my house, I have sort of become the master of minimizing messes:) I think your pine cone turned out SUPER cute even if it was a pain to make! I hope you have a Merry Christmas! lol… I do have to say I did it your way and was thinking this is taking forever. 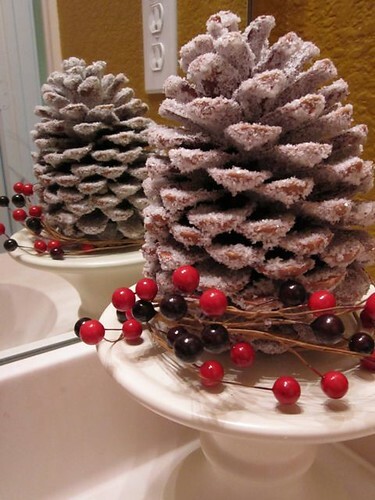 Let’s just says only the top half of the pinecone got done. I think I just had my DUH moment too !!!!!! Love your blog. This is hilarious. I love crafts, and I tend to do them the way you do… the hard way. But, it gets the job done, right? The pinecones really do look great – and, your photos are beautiful. Merry Christmas! Sometimes you have to work with what you’ve got, and not all of us have spray adhesive laying around…basically I would be doing the same thing. So, did you know the shake-in-a-bag supermom approach before you made yours? hahaha. But – super cute! The Dollar Tree sells glitter? Oh my gosh. I am so there. Love this! So simple and pretty! Awesome! My sweet hubby collected a bunch of extra large pinecones and I’ve done nothing with them. Now I have a project! And you are both cute & adorable as well. Thanks for always making me laugh & for bringing a smile to my face. I need it with all the rain we are having. Have a very Merry Christmas. Just don’t get glitter in your eyes.